Attractive antique Victorian Arts & Crafts walnut dressing table. A lovely antique walnut dressing table. We date this dressing table to the late 19th century. The dressing table is provided with a large oblong, front to back swivelling mirror. The mirror glass is thick and bevelled and is only showing some minor signs of foxing. The mirror is supported on two side supports which features a decorative Arts & Crafts design. These supports features two small glove drawers above a bank of three drawers to each side. The base has a full length wide drawer. The drawers are fitted with attractive coppered drop handles mounted on decorative circular embossed brass backplates. The drawers are fitted with locks (no key is supplied but a suitable replacment should be easily obtained if required). 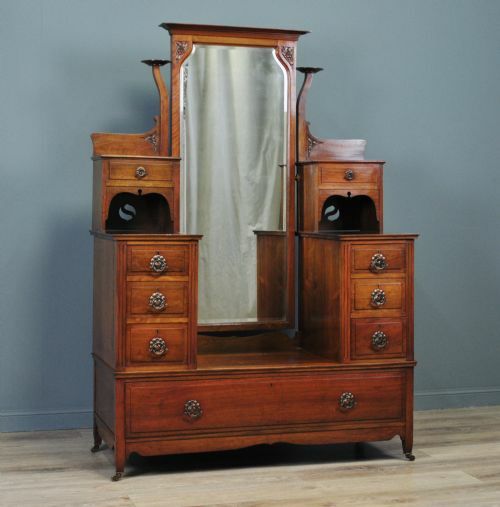 The dressing chest has a height of 69" (175cm) (including mirror), a table height of 36" (91cm), a width of 48" (122cm) and a depth of 22" (56cm). This lovely antique Arts & Crafts walnut dressing table remains in very good solid condition with only very minor surface markings commensurate with age and usage, including some minor indentations and a ring mark to the top surfaces. There are a couple of minor age splits to the outer left hand side. This remains a very stylish and elegant Edwardian Arts & Crafts walnut dressing table which will continue to provide good service for many years to come. 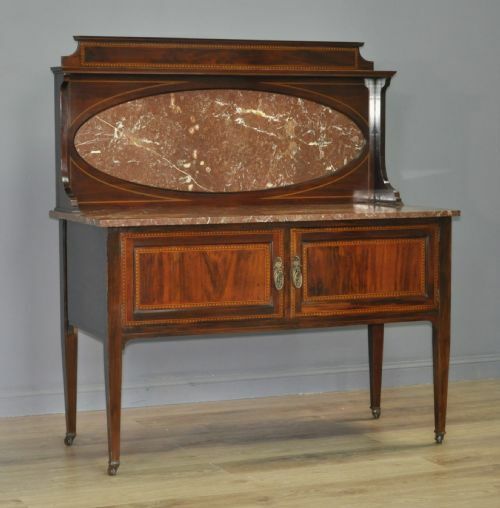 Attractive antique Edwardian Harris Lebus mahogany marble top & back washstand cabinet. A lovely Edwardian harris lebus mahogany washstand. We date this washstand to the early 20th century. The washstand sits on four downward tapered square section legs above ceramic castors. The main table top is an attractive dark red and white mottled marble sheet. The main cabinet consists of a pair of cupboards. The door fronts have central recessed panels and have inlaid banding. The doors are fitted with a decorative shaped drop loop handles mounted on shapely backplates, the doors are secured by ball and cup castors. The rear of the table is fitted with a large gallery supported at the front by two curvilinear brackets. The main panel has a central section housing a large sheet of marble matching the table top. There is a further shelf to the top of the gallery. The washstand has an overall height of 52.5" (133cm) (including gallery) with a table height of 30.5" (78cm), a width of 48" (122cm) and a depth of 22" (56cm). This lovely Edwardian mahogany washstand remains in very good solid condition with only very minor surface markings commensurate with age and usage. There are some minor marks from past use to the finish. There is a bit of wear to some of the edges of the wood with some small slivers missing. The rear marble sheet has a crack but this is difficult to tell unless up close. This remains a very stylish and elegant washstand. It will continue to provide good service for many years to come. 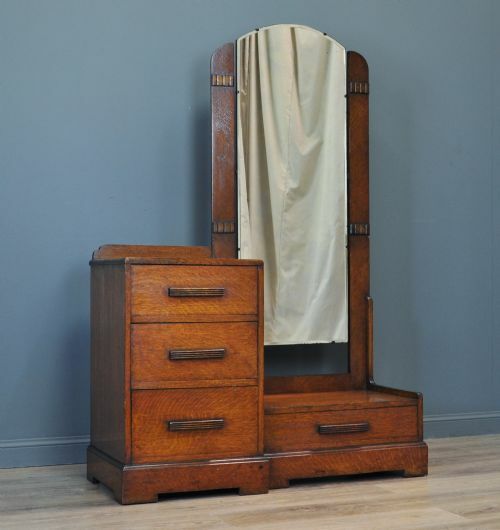 Attractive Art Deco oak dressing table. A lovely Art Deco oak dressing table. We date this dressing table to the 1930/40's. The dressing table sits on a plain plinth base with cut outs to the front and side aprons. There is a bank of three graduated drawers to the left hand side. The drawers are fitted with stand out oak handles. The right hand side is fitted with a full length swiveling cheval mirror over a base drawer. The dressing table has a height of 62.5" (158cm), a width of 43" (108cm) and a depth of 18" (46cm). This lovely Art Deco dressing table has been constructed to a high standard and remains in very good solid condition with only very minor surface markings commensurate with age and usage. There are a few minor marks and indentations to the finish from past use and slight foxing to the edges of the mirror. This remains a very stylish and elegant dressing table. It will continue to provide sterling service for many years to come. 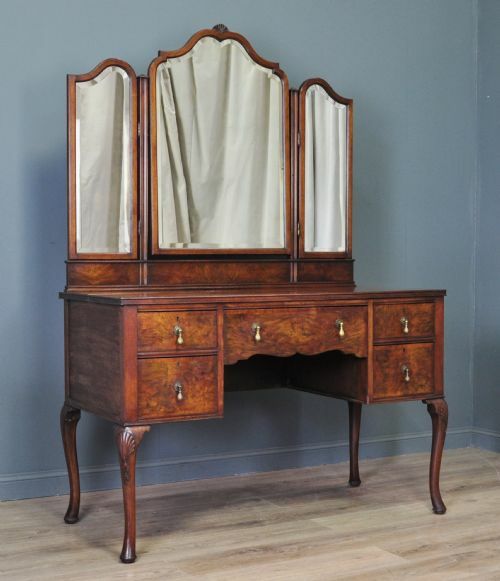 Attractive vintage burr walnut dressing table. A lovely vintage burr walnut dressing table. We date this dressing table to the first half of the 20th Century. The dressing table sits on four Queen Anne style cabriole legs with round pad feet. The dressing table is provided with a large, front to back swivelling mirror, this is flanked by a swivel mirror to each side. The mirror glass is thick and is showing some minor signs of foxing, primarily to the top edges. The mirror features an attractive shell carving to the top of the frame. The main table consists of a wide central drawer flanked by two smaller drawers to each side. All the drawer fronts have been veneered with well matched finely figured burr walnut. The drawers are fitted with matching brass drop handles mounted on shapely backplates. The dressing table is fitted with locks to the outer drawers (no key is supplied but a suitable replacement should be easily obtainable if required). The dressing table has a height of 69" (176cm) (including mirror), a table height of 31.5" (79cm), a width of 50" (127cm) and a depth of 22.5" (57cm). This lovely vintage walnut dressing table remains in very good solid condition with surface markings commensurate with age and usage. It has caught the sun to outer left hand side over time with has made it a little lighter and the top panel to have a slight age split. There is a small piece of beading missing from just under the bottom right hand drawer. The top surface has a few usage indentations and light scratches from past usage. This remains a very stylish and elegant vintage burr walnut dressing table which will continue to provide good service for many years to come.